What I love about this eggplant salad recipe, is that you can use it as a topping for a bruschetta. This salad can be enjoyed warm and cold. It is super easy to make. All it takes is searing the eggplants and chopping up other ingredients. 2 TBP chopped dill (cilantro will work, too). Wash and peel the eggplants. If the eggplants are large, cut them in half and slice the halves lengthwise, measuring 1/8th of an inch. Make sure not to make the slices too thick. Place cut eggplants in a medium bowl, add 1/2 tsp salt and gently toss the eggplants to evenly coat each piece with salt. Heat a large skillet (I had two skillets) to medium high and add a 1/2 TBSP of liquid oil of your choice. You are going to be adding more oil as you sear more eggplant pieces. Searing the eggplants is the longest part of this recipe. Having more than one skillet will accelerate the process. 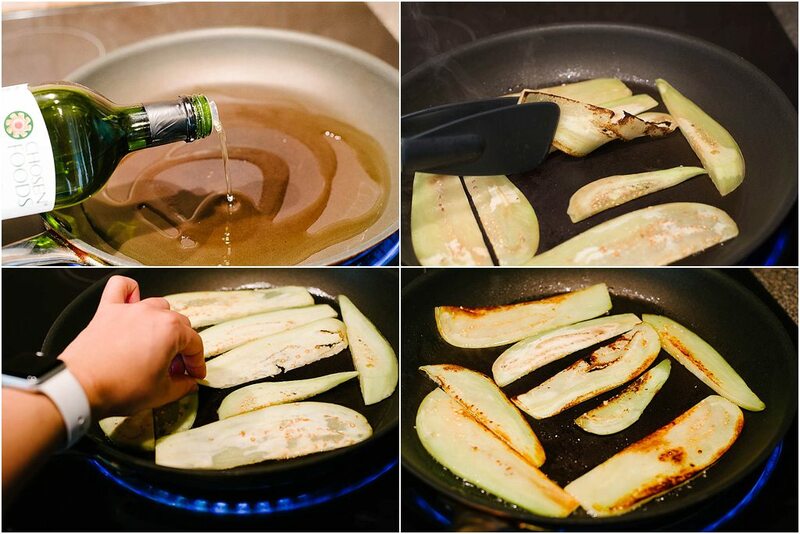 Place eggplants on the heated skillet and sear until the bottom is golden brown in some spots. Flip the eggplants to the other side and let sear. 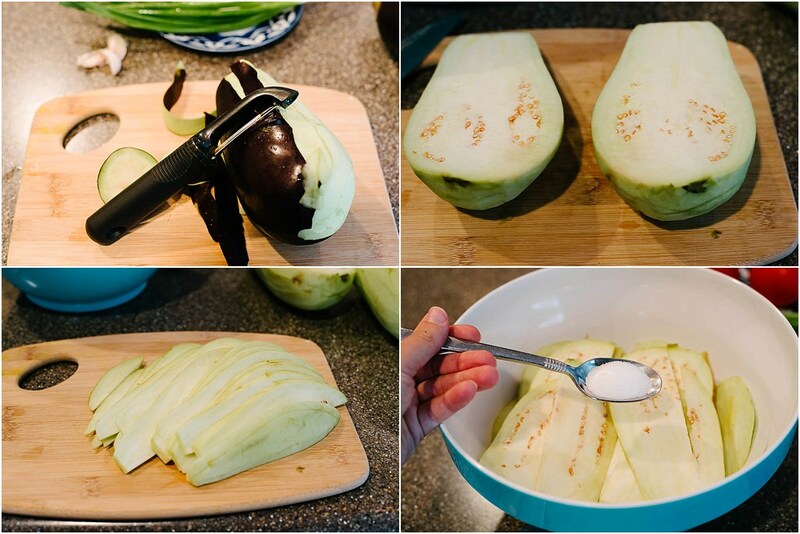 Ready eggplant slices will turn slightly transparent and will be soft to the touch. Transfer the cooked eggplant into a medium bowl or a plate covered in paper tower. Paper towel will soak up the extra grease. Eggplants LOVE oil, they will soak up quite a bit. At the same time you do not want to sear the eggplants pieces in too little oil. This is specific for this salad. You’ll need to add more oil as you go about searing more batches of the eggplant. Add 1/2 TBSP at a time, or as needed. Set aside seared eggplants until needed. 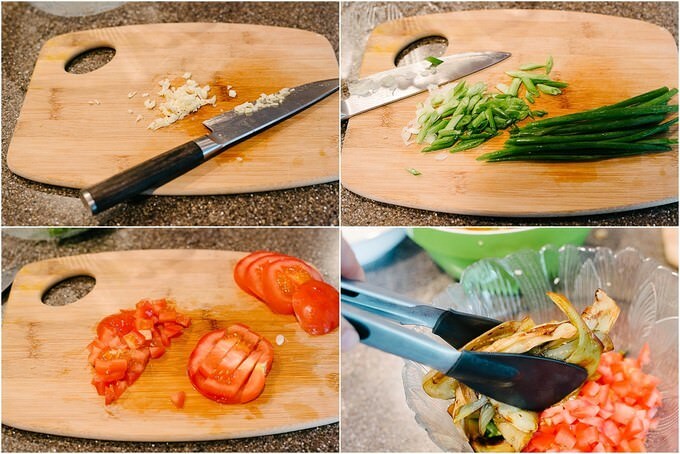 Chop 2 small cloves of garlic, thinly slice scallions and dice 2 tomatoes. Place all of the vegetables in a medium bowl, including the cooked eggplant. Add 2 TBSP dill (I keep mine in the freezer, hence the crystallized particles). Mix all the ingredients well. At this point you can taste the salad and see if it lacks salt. Add more if you need more. Ta-Da! Wasn’t it super easy? 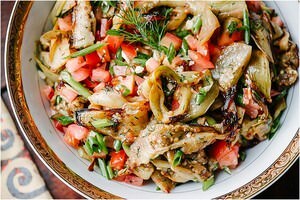 I am looking forward for Arbuz readers to make this eggplant and scallion salad recipe in their kitchens. I hope you like it as much as I do! Share you comments and experiences with this recipe below. I would love to hear your feedback. 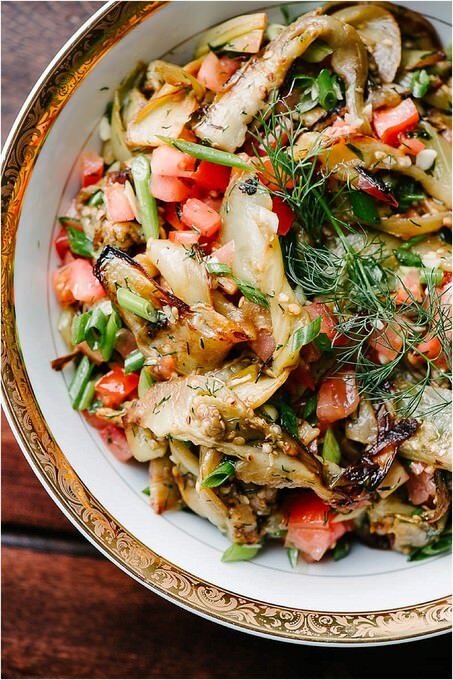 This eggplant and scallion salad recipe is the bomb dot com. What I love about this eggplant salad recipe, is that you can use it as a topping for a bruschetta. This salad can be enjoyed warm and cold. It is super easy to make. All it takes is searing the eggplants and chopping up other ingredients. *2 TBP chopped dill cilantro will work, too. Transfer the cooked eggplant into a medium bowl or a plate covered in paper tower. Paper towel will soak up the extra grease. Eggplants LOVE oil, they will soak up quite a bit. At the same time you do not want to sear the eggplants pieces in too little oil. This is specific for this salad. You’ll need to add more oil as you go about searing more batches of the eggplant. Add 1/2 TBSP at a time, or as needed. Set aside seared eggplants until needed. Add 2 TBSP dill (I keep mine in the freezer, hence the crystallized particles). Mix all the ingredients well. At this point you can taste the salad and see if it lacks salt. Add more if you need more.